© 2017 Leonova et al. Heparan sulfate proteoglycan (HSPG) syndecan-1 (Sdc1) acts as a receptor for triglyceride-rich lipoproteins (TRLs), growth factors, chemokines and enzymes. Due to the disordered structure, its function is as diverse as its ligands. In this paper, we have analyzed hepatic and aortic arch expression of Sdc1 in ApoE-/- mice and examined their association with biochemical changes in plasma during the atheroma formation. ApoE knockout (ApoE-/-) mice as a model of atherosclerosis were used. Plasma chemistry parameters were estimated by automatic biochemical analyzer. The ELISA test was used to detect soluble Sdc1. The mRNA level of syndecan-1 in liver cells and aortic arch was determined by real time PCR. The Sdc1 mRNA level in liver cells was 1.5-2.5 times higher in ApoE-/- mice compared to the wild-type species and increased with age, whereas it remained at the same level in wild-type mice upon aging. Furthermore, the plasma cholesterol level was 4-6 times higher in ApoE-/- mice compared to the wild type; in contrast, triglyceride (TG) remained at the same level. Simultaneously, the expression of Sdc1 in the aortic arch of ApoE-/- mice decreases with age; however, it increases in wild-type mice of the same age. We determined that the Sdc1 mRNA expression in liver cells is significantly higher compared to the cells of aortic arch. In addition, our research demonstrated that the level of soluble Sdc1 slightly increased with age and did not depend on mouse genotype; yet, the total amount of soluble Sdc1 was higher in ApoE-/- mice. Our data suggest that the level of soluble Sdc1 in serum of mice can be associated with chronic inflammation. In addition, we hypothesized that a compensatory increase in the Sdc1 expression in ApoE-/- mice may prevent accumulation of triglycerides in serum, yet having no effect on cholesterol accumulation. Keywords: Syndecan-1, ApoE-/- mice, C57Black mice, Disordered structure, Cholesterol level, HSPG. Sdc1 is HSPG found on the surface of different types of mammalian cells. It belongs to a four-member family of cell surface HSPGs . These molecules are categorized based on their structure and localization. Sdc1 contains an N-terminal signal peptide, an ectodomain, a transmembrane domain, and a short C-terminal cytoplasmic domain. The ectodomain of Sdc1 is covalently attached by heparan sulfate and chondroitin sulfate chains . Sdc1 can function as a receptor and co-receptor modulating the primary signaling receptors at the cell surface interacting with a large number of potential ligands . As a consequence, Sdc1 participates in diverse cellular activities including cell-cell adhesion , wound healing, extracellular matrix organization , binding growth factors  and clearance of triacylglycerol-rich lipoproteins (TRLs) [6, 7]. It may be suggested that the plasticity of the disordered ectodomain of Sdc1 determines its capacity to respond quickly to environmental changes . As a component of the endothelial glycocalyx (EG), syndecan-1 plays a crucial role in regulation of vascular permeability, prevention of blood cell migration to the vessel wall, and transmission of shear stress . It is known that the expression of Sdc1 is highly regulated and depends on the tissue type and the developmental stage . Sdc1 is actively secreted by macrophages and can be enhanced by angiotensin-2 . Gene expression of Sdc1 in B lymphocytes is activated just after their differentiation into antibody-producing plasma cells. For this reason, Sdc1 is widely used as a biomarker of plasma cells [11, 12]. Sdc1 is actively synthesized by hepatocytes, where it also serves as an additional receptor of TRLs . Interestingly, mouse hepatocytes express syndecan-1, -2, and -4, yet the only Sdc1 is the primary hepatocyte HSPG receptor mediating the clearance of TRLs . ApoE acts as a receptor-binding ligand at the surface of chylomicrons and VLDL (very low density lipoproteins)  for receptors in the liver, which include the low density lipoprotein receptor (Ldlr), low density lipoprotein-related protein-1 (Lrp1), and HSPG Sdc1 [15, 16]. As ApoE is the main ligand that mediates TRLs binding and clearance by many types of receptors, deletion of this gene causes broken fat metabolism in mice (Fig. 1). As a result, six-month-old ApoE-/- mice form atherosclerotic plaques even on a normal diet . Consequently, ApoE-/- mice provided the first practical model of hyperlipidemia and atherosclerosis. Sdc1 can also mediate the clearance of TRLs through the ApoAV ligand, which enables its action in the absence of the ApoE ligand [13, 18-20]. Fig. (1). Quantitative syndecan1 mRNA analysis in aortic arch of ApoE-/- mice and C57 Black mice. A: htrp represents relative gene expression of Sdc1 (n = 6, p < 0.05). B: The graph represents relative gene expression of Sdc1 (n = 6, p < 0.05). There are two forms of Sdc1: incorporated into the membrane and soluble, when the ectodomain can be shed from the membrane surface. This process is mediated by extracellular zinc-depended endopeptidases and metalloproteinases . Soluble Sdc1, on one hand, accelerates migration of leukocytes into the intima, thus promoting inflammation [22, 23]. On the other hand, any kind of inflammation can enhance shedding of Sdc1 resulting in its accumulation in the interstitial fluid around the wounds . Nonetheless, the exact mechanism of shedding activation has not been fully determined yet. In healthy organisms, the concentration of soluble Sdc1 is quite low . A high level of soluble Sdc1 is very typical of the tissue recovering after damage or in response to inflammation . In addition, intensive shedding of Sdc1 from the surface of hepatocytes may cause hypertriglyceridemia . We set out to determine how the Sdc1 aortic arch, hepatic expression of Sdc1 in ApoE-/- mice is associated with biochemical changes in plasma during the atheroma formation. Our experimental mice were kept under standard conditions. The study was done in accordance with the standards of care and ethical treatment of animals admitted by the European Convention for the Protection of Vertebrate Animals Used for Research in 1986 in Strasbourg. Experimental mice were obtained from the Branch of the Shemyakin–Ovchinnikov Institute of Bioorganic Chemistry, Russian Academy of Sciences. They were divided into four groups according to genotype and age (Table 1). Table 1. Experimental groups of mice. For taking tissue samples, mice were euthanized in a CO2 chamber. The aortic arch was cut out under a binocular microscope, and liver samples not exceeding 20 μg were taken. All samples were immediately frozen in liquid nitrogen. Frozen tissue samples were stored at -70°C. Total RNA was isolated using the trizol method. The aortic arch and the liver sample were homogenized for 3 min at the frequency of 50 Hz using a TissueLyser machine in the presence of 0.5 ml trizol (Ambion). The homogenate was incubated for 5min at room temperature to complete dissociation of protein–nucleic acid complexes. 100 μl of chloroform was added. The mixture was shaken vigorously for 15s and incubated for 3min at room temperature. The homogenate was centrifuged at +4°C, 15min at 12000 g. The supernatant was collected and transferred to a sterile tube. To precipitate the RNA, an equal volume of isopropanol was added; the mixture was incubated for 10min at room temperature and then centrifuged at +4°C for 10min at 12000 g. The RNA pellet was washed twice by adding 500 μl of 75% ethanol, air-dried and finally dissolved in 30 μl of deionized water. The RNA concentration was measured using a NanoDrop spectrophotometer. Before the additional purification with an RNease minikit (Qiagen) the isolated total RNA was treated with DNase (Fermentas) (Supplementary Material, Table 1). Finally, the RNA concentration was measured using a NanoDrop spectrophotometer and the preparation was frozen at -70°C. The quality of total RNA was evaluated by the ratio260:280. The ratio of A260/A280 ≥ 2.0 shows a high quality of the RNA. Supplement-Table 1. Dnase-1 mix for samples. For the first strand cDNA synthesis we mixed 20 pM of oligo d(T)20 primer, 0.3 mg of the total isolated RNA and deionized water. The total volume of 15 μl was incubated at 65°C for 5 min, then in the reaction 4 μl of 5X buffer of reverse transcriptase with 15 mM MgCl2, 1 μl of 20 mM dNTPs mix, 0.25 μl of RNase inhibitor (40 u/μl) and 0.1 μl of reverse transcriptase (“Thermo”) (200 u/μl) was added and the mixture was incubated for 30min at 50°C and after that for 5 min at 85°C to stop the reaction. The cDNA was stored at -20°C. The amount of cDNA was measured in real time after each amplification cycle. The detection of accumulation of the amplicons was measured by using the SYBRGreen fluorescent intercalating dye. The work was carried out on a DNA-Technology (Russia) thermocycler. Primers for the three reference genes hypoxanthine guanine phosphoribosyl (hprt), glycerol 3-phosphate dehydrogenase, aldehyde (gapdh) and beta-actin (actb) and for the sdc1 gene were used. To select the primers, we used the databases GenBank, MouseGenome, RTPrimerDB, and programs Primer-3plus and Primer 3 web. Synthesis of the primers was performed by Syntol (Russia) (Supplementary Material, Table 2). The reaction mixture was prepared in a total volume of 25 μl per tube (Supplementary Material, Table 3). The PCR program was as follows: 3 min melting at 94°C, then 40 cycles (10s at 94°C and 45s at 60°C). To construct the melting curve, the PCR program was continued by a gradual melting temperature to denature the DNA up to 95°C. Analysis was performed by direct comparison of DNA accumulation graphs of the Cp values of the quantity of second derivatives. The comparison of mRNA of the Sdc1 expression was performed relative to the reference genes . The maximum values of the second derivatives are more accurate due to their location on the exponential growth curve. The average Cp value was automatically determined by a detecting device (a thermocycler). The effectiveness was estimated by the equation: Е = 10(-1/а), where a is the difference in the Cp values determined by a 10-fold dilution of the sample. The mRNA expression level of Sdc1 (X) relative to the reference gene (Y) is determined by the equation: [Х]/[У] = EуСрУ/EХСрХ, where СрУ and СрХ are the values of the threshold cycles of Ср. Supplement-Table 3. Real-time PCR mix for samples. The concentration of soluble syndecan-1 in blood serum of experimental mice was determined by the sandwich ELISA (enzyme-linked immunosorbent assay) test. The test is based on antigen-antibody interaction. Blood samples were collected from the orbital venous sinus of mice under general anesthesia. To obtain the serum, the blood samples were kept overnight at +4°C, and then centrifuged for 20min at 3000 rpm. The collected serum was frozen at -70°C. Further, the analyzed serum was added into a 96-well microliter plate with immobilized antibodies specific to Sdc1. To form a solid phase antibody–antigen complex, the plate was incubated for 2h at 37°C. Then, after removing the liquid phase, the biotin-labeled secondary antibodies were added to bind the antigen and another epitope of syndecan-1. At this stage, the antigen immune complex was formed from immobilized molecules and biotinylated antibodies, which resembled a “sandwich” (hence the name of the method). The secondary incubation lasted for 1h at 37°C, after which the plate was washed three times to remove the conjugate by a special washing buffer. Then, a peroxidase-labeled avidin conjugate was added. Avidin has four high affinity biotin-binding sites. This incubation lasted for 30min at 37°C, after which all wells were washed five times. After that the substrate tetramethylbenzidine (TMB) was added to color the peroxidase substrate. The reaction was performed in the dark at 37°C and continued for about 20 min. Finally, to stop the coloring process, a stop reagent was added. The intensity of staining correlated with the number of detected antibodies specific to syndecan-1. The measurements were performed at a wavelength of 450 nm using a spectrophotometer. The quantitative evaluation was performed using the data from the calibration curve based on standards diluted in several steps, with the already known concentration of antibodies to Sdc1 (Supplementary Material, Table 4). The final concentration of Sdc1 was multiplied by the ratio of the 20-fold diluted initial serum (Supplementary Material, Fig. 1). Supplement-Table 4. Optical density values of standards with known concentrations of syndecan-1. Supplement-Fig. (1). 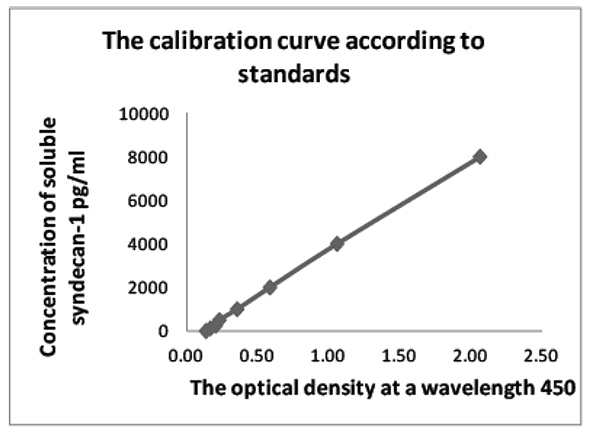 Calibration Curve based on standards diluted in several steps. Clinical chemistry parameters in serum were measured on a SAPPHIRE 400 (Prestige 24i) automatic biochemical analyzer (Tokyo Boeki, Japan) using reagents from Randox Laboratories Ltd: total protein (the biuret reaction method); albumin (the bromocresol green method); urea (the kinetic method with urease); creatinine (the method with alkaline picrate without deproteinization); cholesterol (the cholesteroloxidase method); triglycerides (the lipase and glycerokinase method); alanine aminotransferase (ALT) and aspartate aminotransferase (AST) (the tris buffer method without pyridoxal-5-phosphate, 37°C); alkaline phosphatase (AP) (the p-nitrophenylphosphate method, optimized IFCC); calcium (the arsenaso method); inorganic phosphates (the UV phosphomolybdate measurement method); chlorides (the colorimetric method). For internal quality control, commercial human control sera (Randox) were used. Statistical processing of the concentration values of soluble Sdc1 in serum and mRNA expression levels of Sdc1 was performed by the Student's t-test which allows evaluating a relatively small data selection. The Student’s distribution has properties of a normal distribution for small data selection and has the same value as for large ones. Score confidence probability p is determined by the t-test table. There are three levels of statistics significance. The first level of significance (p < 0.05) means that the accepted error does not exceed 5%, the second (p < 0.01) shows that the error is no more than 1%, and in the third (p < 0.001) the error is no more than 0.1%. Data are presented as means ± SD. Statistical analyses were performed with STATISTICA 7.1 software (StatSoft Inc.). Data were analyzed for normality using the Shapiro–Wilk’s test. In the case of normal distribution, the differences between two groups were analyzed with the unpaired two-sided Student’s t-test. In the other case, the Mann–Whitney U-test was applied. The 0.05 level of significance was used for statistical evaluation. Males from the group of experimental mice (Table 1) were chosen to measure the mRNA expression of Sdc1 in the aortic arch and liver by RTPCR. Thus, 24 of the aortic arch samples and 24 of the liver tissue samples were analyzed. The analysis was performed by a direct comparison of DNA accumulation graphs (Cp) of Sdc1 to the reference genes. Only two of the three reference genes were selected. One was the hprt gene and the other the gapdh gene. This choice was based on the fact that in liver cells of wild-type 8-month-old mice the gene expression of actb decreases compared to that of the other genes, which remained on the same level (Supplementary Material, Table 5). The hprt gene encodes the protein responsible for the exchange of purines in the cell, and the gapdh gene encodes the enzyme, which plays an important role in the process of glycolysis. Their expression is considered to be relatively constant in various types of tissues, and these genes are found to be reliable for the semi-quantitative analysis by RTPCR . Our data showed that the difference in the threshold cycles (ΔCp) of the hprt and gapdh genes was very close in values (Supplementary Material, Table 5). This makes it possible to analyze the changes in gene expression of Sdc1 in samples of experimental animals (Supplementary Material, Tables 6-9). Statistical processing of the data by the Student's t-test revealed significant differences between experimental groups (Supplementary Material, Tables 10, 11). Supplement-Table 5. Values of ΔCp for the reference genes in aortic arch and liver cells. Based on these results, it was found that the percent size of mRNA of Sdc1 in the walls of the aortic arch dramatically increases with age (p <0,001) in wild-type mice and is reduced (p < 0.05) in ApoE-/-mice (Fig. 1). Supplement-Table 6. Measured data of sdc1 mRNA of 3-month-old male ApoE-/- mice. Supplement-Table 7. Measured data of sdc1 mRNA of 8-month-old male WTC57Black mice. Supplement-Table 8. Measured data of sdc1 mRNA of 3-month-old male WTC57Black mice. Supplement-Table 9. Measured data of sdc1 mRNA of 8-month-old male ApoE-/-mice. Analysis of the liver tissue showed that the relative mRNA levels of mRNA Sdc1 increased in ApoE-/-mice with age (p <0.001) (Fig. 2) and did not change in wild-type mice (p < 0.05). Supplement-Table 10. Statistics significance levels of comparison groups based on the results in gene expression of syndecan-1 of aortic arch. Supplement-Table 11. Statistics significance levels of comparison groups based on the results in gene expression of syndecan-1 of liver cells. Fig. (2). 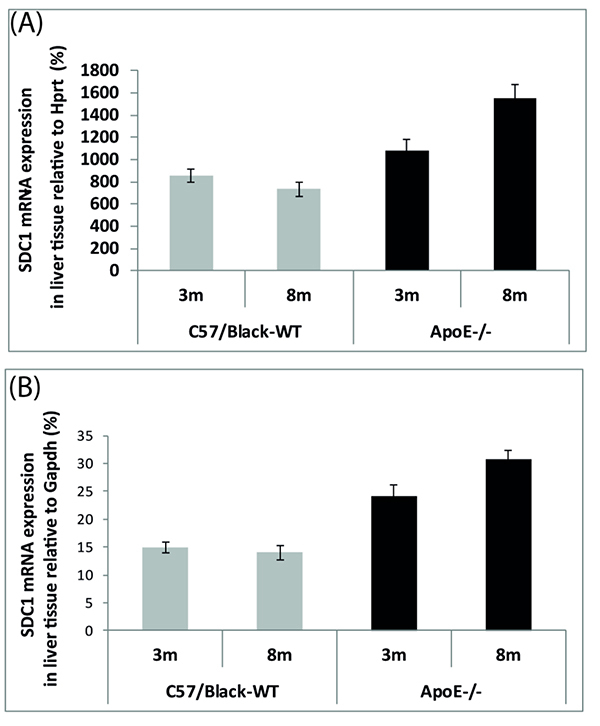 Quantitative syndecan1 mRNA analysis in the liver of ApoE-/-mice and C57Black mice. A: htrp represents relative gene expression of Sdc1 (n = 6, p < 0.05). B: The graph represents relative gene expression of Sdc1 (n = 6, p < 0.05). It was shown that the relative mRNA levels of Sdc1 in the liver cells are much higher compared to the aortic arch cells of experimental mice. The concentration of soluble Sdc1 in blood serum of experimental mice was determined using the ELISA method. The blood serum was collected from the orbital venous sinus under general anesthesia of experimental animals (Table 1). Hence 48 blood samples were examined and each trial was performed twice (Supplementary Material, Tables 12-15). The Student’s t-test revealed great differences in the statistics significance between groups (n = 12, p < 0.001) (Supplementary Material, Tables 16, 17). The results indicate that the level of soluble Sdc1 in serum increases with age regardless of the genotype, but in general it is higher in the ApoE-/-mice (Fig. 3). Supplement-Table 12. ELISA data of ApoE-/- of 3-month-old mice. Supplement-Table 13. ELISA data of wild-type C57Black 8-month-old mice. Supplement-Table 14. ELISA data of wild-type C57Black 3-month-old mice. Supplement-Table 15. ELISA data of ApoE-/- of 8-month-old mice. Fig. (3). Levels of soluble Sdc1 in blood serum of experimental mice estimated using the enzyme immunoassay. Supplement-Table 16. Statistics significance levels of comparison groups based on the results of ELISA. Supplement-Table 17. Statistics significance levels of comparison groups based on the results of serum biochemistry. 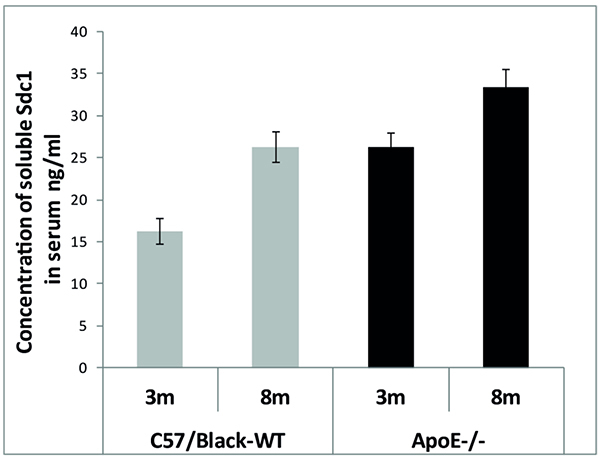 Data on the serum biochemistry parameters in ApoE-/- and C57Black mice are given in Table 2. Our results show that deletion of the АpoE gene in mice results in a 4–6 times higher cholesterol level than in С57Black mice (Table 2). In contrast, the triglyceride level and other parameters are only negligibly affected and remain within the normal limits established for C57Black mice (Charles River Laboratories) . Table 2. Serum biochemistry parameters in mice relative to age and genotype. Retro-orbital collection method. In our experiments the control C57Black mice were prone to obesity. We noticed that 8-month-old wild-type mice were much fatter compared to ApoE-/-mice of the same age. For this reason, C57Black mice were used to generate ApoE-/- mice. The first mouse carrying the ApoE knockout gene was created by Nobuyo Maeda in 1991 . Along with it, she tried to get mice with hypercholesterolemia by destroying the ApoB100 and ApoA1 genes, but neither of mutants showed atheroma formation. Exactly the opposite, apoB100 knockout mice had decreased levels of LDL particles [31, 32], and ApoA1 knockout mice had reduced plasma cholesterol levels . Finally, the lack of ApoE caused severe hypercholesterolemia in mice. Nobuyo Maeda suggested a possible explanation of the high cholesterol level as significant accumulation of TRLs particles in mouse plasma . And it was quite logical, because ApoE is the main ligand for hepatic TRLs receptors, including Sdc1 [13, 15, 16, 18-20]. Because the plasma TG level correlates directly with the plasma TRLs level, we measured the TG level . Yet, our result showed that the plasma TG level remained within the normal range and did not depend on the genotype (Charles River Laboratories) . The same result was obtained in 1996 by the Havekes group . Even the claim by Mohammed H. Moghadasian & Сo that ApoE-/- mice have a two times higher level of plasma TG compared to the wild type  demonstrated that the concentration of TG in all groups of mice was within the normal range, according to the data of Charles River Laboratories and of Fernandez & Сo group . It might be possible that destruction of one gene can activate compensatory mechanisms to offset the “knockout”. It is known that, besides the ApoE ligand that is crucial for function of Ldlr and Lrp1 receptors, Sdc1 can mediate the hepatic clearance of TRLs through the ApoA ligand . In addition, the Havekes group have found a dramatically high TG level in the liver (+232%) tissue of ApoE-/- mice , which also supports our idea of TRLs clearance by hepatic Sdc1. Further research is required to determine whether or not a compensatory increase in hepatic Sdc1 expression can prevent the hypertriglyceridemia in ApoE-/- mice. In addition, we hypothesize that the high cholesterol level in ApoE-/- mice can be a result of interruption of reverse transport of cholesterol. It has been shown that elimination of ApoE leads to significant disruption of HDL. As a consequence, cells stop synthesizing new LDL receptors in response to cholesterol supply and at the same time LDL accumulate in serum. We observed that all 8-month-old ApoE-/-mice had atherosclerotic plaques in the aorta, which could be easily visualized with a binocular microscope. In contrast, there were no atherosclerotic plaques in the aorta of 8-month-old C57Black mice, although they were very fat. It should be emphasized that the syndecan-1 gene in the aortic arch was expressed at a very low level in all groups of mice. At the same time, we want to bring to notice that it increased in C57Black mice and decreased in ApoE-/- mice with age. We suggest that the increasing level of the Sdc1 gene expression in the aortic arch of C57Black mice might contribute to keeping EG of vessels safe and healthy. At the same time, the decreasing level of the Sdc1 gene expression in the aortic arch of ApoE-/- mice supports the idea that the high LDL level in serum leads to cholesterol accumulation in the arterial wall. Such cholesterol invasion in the vessel’s wall leads to endothelium damage and atheroma formation. In addition, our results have shown that the level of soluble syndecan-1 increases slightly with age and does not depend on mouse genotype. In any case, the total amount of soluble syndecan-1 is higher in ApoE-/- mice. Оur findings indicate that further studies should be conducted to evaluate the effect of Sdc1 on the lipid metabolism, as well as on the long-term safety of vessel-wall EG. The authors thank Igor Granovsky and Victor Selivanov from the Institute of Biochemistry and Physiology of Microorganisms for their reviews and valuable advice, and Tatyana B. Kuvshinkina for her help in preparation of the manuscript. Choi Y, Chung H, Jung H, Couchman JR, Oh E-S. Syndecans as cell surface receptors: Unique structure equates with functional diversity. Matrix Biol 2011; 30(2): 93-9. Carey DJ. Syndecans: multifunctional cell-surface co-receptors. Biochem J 1997; 327(Pt 1): 1-16. Morgan MR, Humphries MJ, Bass MD. Synergistic control of cell adhesion by integrins and syndecans. Nat Rev Mol Cell Biol 2007; 8(12): 957-69. Fears CY, Woods A. The role of syndecans in disease and wound healing. Matrix Biol 2006; 25(7): 443-56. Rapraeger AC. Syndecan-regulated receptor signaling. J Cell Biol 2000; 149(5): 995-8. Wilsie LC, Gonzales AM, Orlando RA. Syndecan-1 mediates internalization of apoE-VLDL through a low density lipoprotein receptor-related protein (LRP)-independent, non-clathrin-mediated pathway. Lipids Health Dis 2006; 5: 23. MacArthur JM, Bishop JR, Stanford KI, et al. Liver heparan sulfate proteoglycans mediate clearance of triglyceride-rich lipoproteins independently of LDL receptor family members. J Clin Invest 2007; 117(1): 153-64. Leonova EI, Galzitskaya OV. Cell communication using intrinsically disordered proteins: what can syndecans say? J Biomol Struct Dyn 2015; 33(5): 1037-50. Weinbaum S, Tarbell JM, Damiano ER. The structure and function of the endothelial glycocalyx layer. Annu Rev Biomed Eng 2007; 9: 121-67. Asplund A, Ostergren-Lundén G, Camejo G, Stillemark-Billton P, Bondjers G. Hypoxia increases macrophage motility, possibly by decreasing the heparan sulfate proteoglycan biosynthesis. J Leukoc Biol 2009; 86(2): 381-8. Caraux A, Klein B, Paiva B, et al. Circulating human B and plasma cells. Age-associated changes in counts and detailed characterization of circulating normal CD138- and CD138+ plasma cells. Haematologica 2010; 95(6): 1016-20. Kim CW, Goldberger OA, Gallo RL, Bernfield M. Members of the syndecan family of heparan sulfate proteoglycans are expressed in distinct cell-, tissue-, and development-specific patterns. Mol Biol Cell 1994; 5(7): 797-805. Stanford KI, Bishop JR, Foley EM, et al. Syndecan-1 is the primary heparan sulfate proteoglycan mediating hepatic clearance of triglyceride-rich lipoproteins in mice. J Clin Invest 2009; 119(11): 3236-45. Dergunov AD, Rosseneu M. The significance of apolipoprotein E structure to the metabolism of plasma triglyceride-rich lipoproteins. Biol Chem Hoppe Seyler 1994; 375(8): 485-95. Goldstein JL, Brown MS, Anderson RG, Russell DW, Schneider WJ. Receptor-mediated endocytosis: concepts emerging from the LDL receptor system. Annu Rev Cell Biol 1985; 1: 1-39. Mahley RW, Hui DY, Innerarity TL, Weisgraber KH. Two independent lipoprotein receptors on hepatic membranes of dog, swine, and man. Apo-B,E and apo-E receptors. J Clin Invest 1981; 68(5): 1197-206. Deuchar GA, McLean D, Hadoke PW, et al. 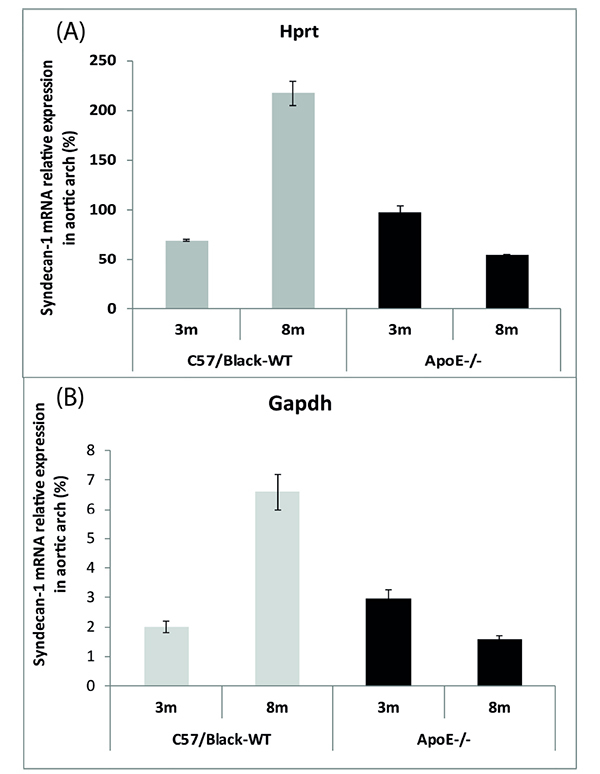 11β-hydroxysteroid dehydrogenase type 2 deficiency accelerates atherogenesis and causes proinflammatory changes in the endothelium in APoE-/- mice. Endocrinology 2011; 152(1): 236-46. Getz GS, Reardon CA. Apoprotein E as a lipid transport and signaling protein in the blood, liver, and artery wall. J Lipid Res 2009; 50(Suppl. ): S156-61. Gonzales JC, Gordts PL, Foley EM, Esko JD. Apolipoproteins E and AV mediate lipoprotein clearance by hepatic proteoglycans. J Clin Invest 2013; 123(6): 2742-51. Fitzgerald ML, Wang Z, Park PW, Murphy G, Bernfield M. Shedding of syndecan-1 and -4 ectodomains is regulated by multiple signaling pathways and mediated by a TIMP-3-sensitive metalloproteinase. J Cell Biol 2000; 148(4): 811-24. Purushothaman A, Uyama T, Kobayashi F, et al. Heparanase-enhanced shedding of syndecan-1 by myeloma cells promotes endothelial invasion and angiogenesis. Blood 2010; 115(12): 2449-57. Savery MD, Jiang JX, Park PW, Damiano ER. The endothelial glycocalyx in syndecan-1 deficient mice. Microvasc Res 2013; 87: 83-91. Götte M. Syndecans in inflammation. FASEB J 2003; 17(6): 575-91. Kim JM, Lee JA, Cho IS, Ihm CH. Soluble syndecan-1 at diagnosis and during follow up of multiple myeloma: a single institution study. Korean J Hematol 2010; 45(2): 115-9. Vanhoutte D, Schellings MW, Götte M, et al. Increased expression of syndecan-1 protects against cardiac dilatation and dysfunction after myocardial infarction. Circulation 2007; 115(4): 475-82. Deng Y, Foley EM, Gonzales JC, Gordts PL, Li Y, Esko JD. Shedding of syndecan-1 from human hepatocytes alters very low density lipoprotein clearance. Hepatology 2012; 55(1): 277-86. Tan SC, Carr CA, Yeoh KK, Schofield CJ, Davies KE, Clarke K. Identification of valid housekeeping genes for quantitative RT-PCR analysis of cardiosphere-derived cells preconditioned under hypoxia or with prolyl-4-hydroxylase inhibitors. Mol Biol Rep 2012; 39(4): 4857-67. Fernández I, Peña A, Del Teso N, Pérez V, Rodríguez-Cuesta J. Clinical biochemistry parameters in C57BL/6J mice after blood collection from the submandibular vein and retroorbital plexus. J Am Assoc Lab Anim Sci 2010; 49(2): 202-6. Maeda N. Development of apolipoprotein E-deficient mice. Arterioscler Thromb Vasc Biol 2011; 31(9): 1957-62. Johnson LA, Altenburg MK, Walzem RL, Scanga LT, Maeda N. Absence of hyperlipidemia in LDL receptor-deficient mice having apolipoprotein B100 without the putative receptor-binding sequences. Arterioscler Thromb Vasc Biol 2008; 28(10): 1745-52. Toth LR, Smith TJ, Jones C, de Silva HV, Smithies O, Maeda N. Two distinct apolipoprotein B alleles in mice generated by a single ‘in-out’ targeting. Gene 1996; 178(1-2): 161-8. Li H, Reddick RL, Maeda N. Lack of apoA-I is not associated with increased susceptibility to atherosclerosis in mice. Arterioscler Thromb 1993; 13(12): 1814-21. Miller M, Stone NJ, Ballantyne C, et al. Triglycerides and cardiovascular disease: a scientific statement from the American Heart Association. Circulation 2011; 123(20): 2292-333. Kuipers F, van Ree JM, Hofker MH, et al. Altered lipid metabolism in apolipoprotein E-deficient mice does not affect cholesterol balance across the liver. Hepatology 1996; 24(1): 241-7. Moghadasian MH, McManus BM, Nguyen LB, et al. Pathophysiology of apolipoprotein E deficiency in mice: relevance to apo E-related disorders in humans. FASEB J 2001; 15(14): 2623-30.